Matcha Tea, made from stone-ground, Japanese green tea leaves, has a body and flavor that is thick and rich and green with a slight bitterness. It's thought to be even healthier than normal green tea, because the entire tea leaf is consumed, instead of just the infusion as with normal teas. And since it is a powder, it can be incorporated into just about any cooking recipe, swapped out for a little flour. 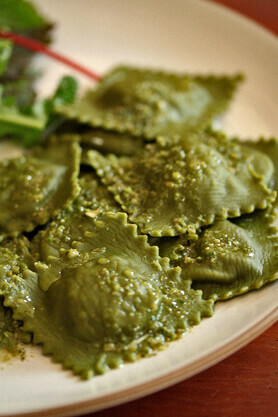 Its deep green hue and flavor add a lot of appeal to home made pasta. Inspired by the green of this past spring, I used Arbor Teas cooking grade Organic Matcha Green Tea to make matcha ravioli. I filled the pasta with a green pea and Italian white bean puree, and topped it with a garlic scape-kale pesto. So very green! A more simple filling idea would be to use an herb-laced ricotta. After reading this post by Smitten Kitchen, I've fallen into the habit of making my own lately. It's really very simple to do. Even simpler, cut the fresh matcha pasta into thin linguini strands, cook in boiling water, and top with your favorite sauce. Add the flour and matcha to the work bowl of a food processor and pulse a few times to evenly distribute. Add the eggs. Process again for about 30 seconds until the dough forms a rough ball. It's OK if some small bits remain unincorporated. Turn the contents of the work bowl onto a floured surface and knead until the dough is smooth, 1 to 2 minutes. Cover with plastic wrap and set aside for at least 15 minutes and up to 2 hours, allowing the dough to relax. Dough that has the perfect amount of moisture will come together in one large mass. If the dough resembles small pebbles it is too dry; with the motor running, add water ½ teaspoon at a time until the dough forms a rough ball. If the dough sticks to the side of the work bowl it is too wet; add flour, 1 tablespoon at a time, and process until the dough is no longer tacky and forms a rough ball. Using a manual pasta machine or a rolling pin, roll out the dough into thin, satiny sheets. It should be rolled thin enough that you are able to see the outline of your hand through the pasta. Lay the sheet of pasta on a clean kitchen towel and cover it with a damp cloth to keep it from drying out. Repeat with the other pieces of dough. Leave the pasta as is for use in filled pastas or cut the pasta sheets into long strands to make fettuccine. If making ravioli, place a dollop of the filling along the rolled sheet every few inches. Lay another sheet of dough directly over the filling and press down to seal the ravioli. Cut into squares with a pastry wheel. Place the cut ravioli on a floured baking tray and repeat with the remaining dough and filling. If you don't plan to cook the ravioli right away, place the baking tray full of finished ravioli (in one layer only) in the freezer. Once the ravioli have frozen solid, you can transfer them into a zip-top plastic bag and continue to freeze until ready to use. When ready to serve, drop the frozen ravioli directly into a large pot of salted boiling water for 4 or 5 minutes. Carefully remove cooked ravioli with a slotted spoon and then toss with sauce. Lightly saute the garlic scapes and peas in butter until softened. Transfer to the bowl of food processor. Blend the scapes, peas, olive oil, lemon juice, salt and pepper until fairly smooth. Add the cooked beans and blend until smooth. Taste and adjust seasonings as needed. Let cool before filling the ravioli. Process scapes, kale, and nuts in the bowl of a food processor until well combined and somewhat smooth but not purely pureed. Slowly drizzle in oil and process again until incorporated. Add salt and pepper to taste.